Secretary of State Condoleezza Rice, leading the first high-level U.S. diplomatic mission since war broke out in Lebanon, said Tuesday the time has come for a new Middle East and an urgent end to the violence hanging over the region. "I have no doubt there are those who wish to strangle a democratic and sovereign Lebanon in its crib," Rice said. "We, of course, also urgently want to end the violence." Standing beside Israeli Prime Minister Ehud Olmert as they prepared to meet in his office, Rice reiterated the United States position that a cessation of hostilities in Lebanon must come with conditions that make an enduring peace. She said she has "no desire" to be back in weeks or months after terrorists find another way to disrupt any potential cease fire. "It is time for a new Middle East," she said. "It is time to say to those that don't want a different kind of Middle East that we will prevail. They will not." 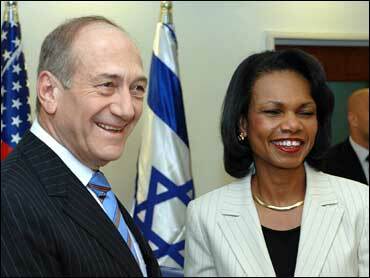 Olmert welcomed Rice warmly and vowed that "Israel is determined to carry on this fight against Hezbollah." He said his government "will not hesitate to take severe measures against those who are aiming thousands of rockets and missiles against innocent civilians for the sole purpose of killing them." Later, Olmert told a group of new immigrants from France that Israel has the stamina for a long fight and is determined to defeat Hezbollah. After meeting with Palestinian President Mahmoud Abbas later Tuesday, Rice said, "We need to get to a sustainable peace, there must be a way for people to reconcile their differences." Israeli forces have surrounded Hezbollah's main stronghold in the south and Israeli war planes continue their heavy bombing of the city of Tyre, reports CBS News chief foreign correspondent Lara Logan. Hezbollah fired at least 40 rockets on northern Israel Tuesday, killing a teenage girl in the Arab town of Maghar and injuring at least 23 others, medics said. The port city of Haifa was also hit and at least five people were injured there, one seriously and two moderately. Most shops and businesses in Haifa remain closed, reports CBS News correspondent Robert Berger. A top Hamas official in Syria says Israeli soldiers held by Hamas and Hezbollah will only be released as part of a prisoner swap. A cease-fire must be in place before there is any thought of sending international troops to Lebanon, Germany's defense minister said Tuesday after meeting with his French and Polish counterparts. Turkey, the only Muslim member of NATO, said it would consider playing a major role in any peacekeeping force deployed after an end to hostilities. Saudi King Abdullah appealed to the world Tuesday to stop Israeli attacks on Lebanon, saying that if peace moves fail, the Middle East could be engulfed in war. He also pledged $1.5 billion in donations to Lebanon — $500 million for reconstruction, $1 billion to support the economy. The European Union appealed to Israel and Hezbollah militants on Tuesday to allow international aid workers access to victims of fighting in southern Lebanon. "It's absolutely vital that assistance gets through," said EU spokesman Amadeu Altafaj Tardio. Rice, who has disappointed some U.S. allies with her support of Israel, also met Tuesday with Israel Defense Minister Amir Peretz. Rice made no public remarks after her meetings with Olmert and Peretz. But Peretz told reporters Israel still has U.S. support, reports CBS News correspondent Dan Raviv. "We want to defend our citizens, and we have broad international support ... We have no desire to open a war against Syria," Peretz said. The Bush administration has said it wants to address the overall threat from Hezbollah, a Shiite militia in Lebanon, by creating conditions that will give the weak Lebanese government control over its entire territory, including south Lebanon, which is under Hezbollah control. In a brazen July 12 raid into northern Israel, Hezbollah killed eight Israeli soldiers and captured two others, provoking Israel's biggest military campaign against Lebanon in 24 years. Hezbollah has fired hundreds of rockets at northern Israeli communities. Israeli forces have been hammering Gaza to the south since shortly after the June 25 capture of an Israeli soldier by militants linked to Hamas group. The subsequent turmoil has highlighted the weakness of Abbas, a moderate whose Fatah party lost parliamentary elections to Hamas in January. Both Hamas and Hezbollah have said the two attacks were not connected. Israel has responded with force on both fronts. The U.S. has insisted it will not support an immediate cease fire if the conditions behind the fighting aren't addressed. Lebanese leaders had hoped Rice's trip would hasten a cease-fire in the fighting between Israel and Hezbollah militants that has killed hundreds of Lebanese and displace more than half a million others. In a meeting that appeared tense, Lebanese Prime Minister Fuad Saniora told Rice on Monday that Israel's bombardment had taken his country "backwards 50 years," the prime minister's office said. Nabih Berri, a veteran Lebanese politician who is Lebanon's parliament speaker and Hezbollah's de facto negotiator, rejected proposals brought by Rice almost as soon as she left. Rice had proposed that the fighting stop at the same time that an international force deployed in southern Lebanon, an official close to the speaker said. Rice also proposed that Hezbollah weapons be removed from a buffer zone extending about 18 miles from the Israeli border, said the official. He spoke on condition of anonymity because the talks were private. "Clearly, in the Arab world, one of the reactions is growing hostility to Israel and to the United States, and that reinforces essentially what is already out there," Richard Haass, president of the Council on Foreign Relations, said on CBS News' The Early Show. "The other reaction in the Arab world is to me in some ways interesting and less familiar and that is the resentment of Hezbollah. We're seeing a real split in the Arab world between the Sunni Muslims and those more aligned with the Shia."